5 1/2 hours non-stop concentration. On Oct 14th 2016 at the Culture night in Copenhagen I was creating my life´s 1st skirmish artwork at Kunsthal Charlottenborg, Copenhagen. 5 1/2 hours with deep concentration and my power of abstraction in my own calm and peaceful inner universe together with the impressing skirmish artwork 3 x 7 meter by Simone Aagaard Kaern, talks, and 4000 march pasting discussion desiring vistors on guided tours in big groups through the palace. 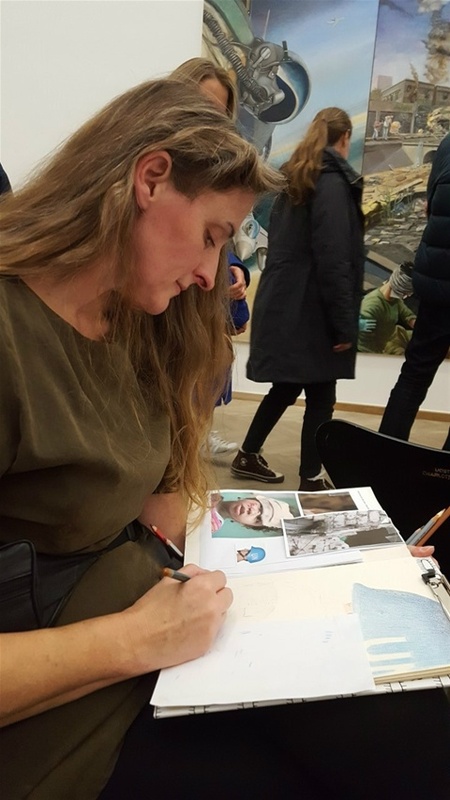 My own small A4 size batalje (skirmish) artwork , "Saved1" showing a rescued child on a Danish UN-soldier shoulder, ended up on show on the opposite wall of the masterpiece throughout this week 42 at 3rd floor of Charlottenborg. A lot of you blog readers came and afterwards some of you asked me why I didn´t participate in the discussions, provocated at all or marked myself and at the same time you noticed that silent and introvert I somehow with an, according to you, inborn charisma and deep long concentration happened to create a calm atmosphere in a room overfilled with war, drama, death, lots of people talking and walking in and out of the big palace hall. First of all and most important: It was not my "party". Simone is the master of this kind of art, her 3m x 7 m artwork, which had taken her several years to create, is the theme and master piece of this show. I was just a guest at the workshop, and guests don´t take all the attention from the key person. It´s called "good manners", "good attitude" and "respect" and unfortunately, only a infinitesimal group of people practice it in a world and time of history, where it´s all about being "on" all the time. This "me, me, me, me, me and see me"- trend is almost an integrated part of comtemporary time´s normal way of social behavior. Another reason is that I think it is no art destroying what other people have created. Everybody can do that. There is much more challenges in fitting in anonymeously and create your own unique artistically "room" and universe which supports the theme and spirit of the environment. .... - just because I can. I think I am doing great as an artist without this kind of primitive behaviour. This summer I got a record high number of museum calls: I had 37 calls for entries for museum exhibitions this autumn and winter from you international curators. Thank you SO much for still counting and rembering me though I am very ill right now and can´t work so much or travel. I have some bad experiences with me in my backpack, and I am suffering from a hormone disease, which among other tings makes it more difficult for me than other people to concentrate...- or at least it should be. I am positively surprised and impressed myself, that I succeeded in concentrating for 5 1/2 hours drawing/painting at this culture night. Another reason for my lack of participation in the "war scenes" around me was, that I needed to focus 100% on capturing my own 2 characters on my artwork in progress, right where they are, 2000 km´s away in another culture, and another state of mind. 5 1/2 hours and 34 crayons and inks are normally not enough time and ressources for me to create an artwork / illustration of this size. I use to spend several days and 300-400 colour crayons and inks on one piece of my small artworks. If I would do it again? Absolutely! ..... - if I get an invitation. Batalje- (Skirmish) exhibition by Simone Aagard Kaern continues at Charlottenborg, Nyhavn 2, 1051 Copenhagen until Nov 6th. If you are in Copenhagen and haven´t seen it, do it ... Give yourself some time for reflection and food for thoughts.